There are 153,000 vegetarians in the Czech Republic, comprising 1.5% of the population. Some are AAU students, who come from all over the world and do not know where to eat “green.” Lennon Wall has prepared a list of places where a vegan can eat in one of most pork-consuming cities in the world. Sweet Secret of Raw is a vegan breakfast spot located in Prague 2. 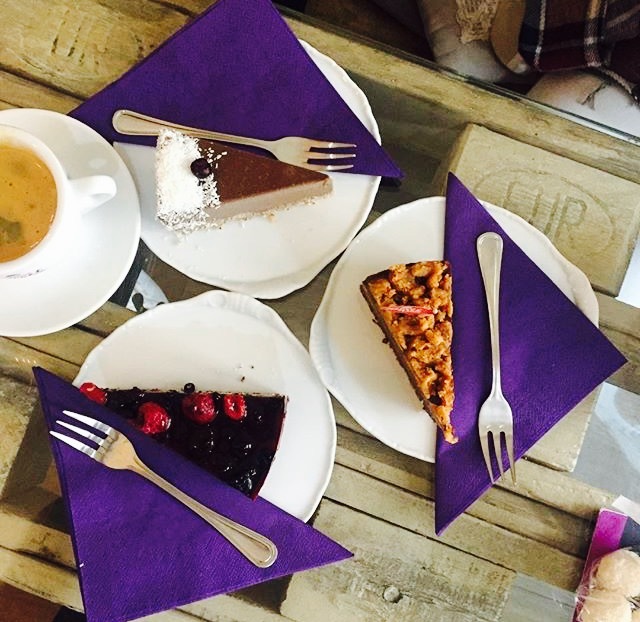 It is the first raw pastry-shop in the Czech Republic. All of the cakes are vegan, gluten and sugar free. The place suits vegans and vegetarians alike, as well as those who follow a raw food diet and those who cannot live without cake but like to take care of their bodies. If you do not fall into either of these categories but appreciate delicious food, do not hesitate to visit this place. Friendly staff serves amazing cakes, smoothies, coffee and tea. There are close to 20 different types of skillfully made and extraordinary looking cakes, cheesecakes and pies. Chocolate, pistachio, berries, acai, lavender, matcha, basil-pineapple and even rafaelo (Rawfaelo is its name) and stracciatella – there is a sweet treat for each and every one! Another vegan place, Loving Hut, is the worldwide famous restaurant chain with three equally good spots in Prague. It is a perfect place for someone who wants a fast, cheap, but still nice and healthy meal. Loving Hut has a variety of vegan dishes for a customer to choose from and pay by the weight. There is a lot to try, so make sure you get tired and hungry walking around Prague and come to Loving Hut for lunch. A perfect ending to the vegan day off would be a dinner in a beautiful restaurant where tiny portions equal big money. Etnosvet is a place for someone who appreciates the way the dish looks just as much as it tastes. The restaurant has a rich á la carte menu that includes both vegetarian and vegan dishes, and a daily menu that is served every day from 11:30 to 16:00. Fine-dining lovers can taste exceptional meals such as creamy chestnut soup (Kaštanové velouté), pasta with forest mushrooms (Pappardelle) or burger with beetroot and goat cheese (Alpský burger). If you want to feel like a local, you can order Czech tartare (vegan version – Veganský tataráček) that is served with crackers and garlic like a traditional beef version. Chestnut dumplings (Kastanové knedlíčky) is part of the children’s menu, but adult fans of Czech cuisine will enjoy it as well. It is always a good idea to make a complete circle and finish the day with another dessert (thumbs up for “breakfast for dinner”). Whatever you choose – passion-fruit parfait (Marakujové parfait), chocolate fondant (Čokoládový fondant) or apple crumble (Jablečný crumble) – it won’t be a disappointment. Fine dining is good, but if you are hungry and broke, there is another option. Shady streets of Žižkov continuously surprise with new, hip places. Belzepub is a punk bar where you can enjoy a big, juicy vegan burger with tons of Czech beer. The crowd is loud and fun, the atmosphere heady (or is it the beer? ), the portions are generous and the prices are low. What else does a student need?